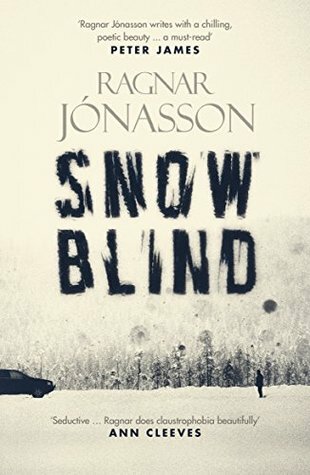 ‘Snow Blind’, the debut novel by Icelandic author Ragnar Jonasson, sensitively translated by Quentin Bates, has clearly been written from the heart. It’s filled with affection for an utterly unforgiving and compellingly beautiful corner of the world, the tiny town of Siglufjörður, perched on the edge of a deep fjord in northern Iceland, 25 miles south of the Arctic circle and overlooked by imposing mountains. And for the brave, or foolish, people who choose to live there, now that the herring industry which made the town boom in the 1950s has all but gone. And it overflows with the fondly -portrayed character traits of rookie cop Ari Thor Arason, an unconventional, appealing addition to the roster of contemporary Scandinavian investigators. Ari Thor is impulsive, at times a little awkward, yet also engaging, dogged and idealistic, and the novel uncannily reflects his strong presence. Like Ari Thor, ‘Snow Blind’ is a little awkward in places, its structure feeling a touch contrived especially at the beginning, but a little patience is amply rewarded and I was gradually seduced by Jonasson’s wonderful sense of place, and won over by his quirky cast and clever plot. 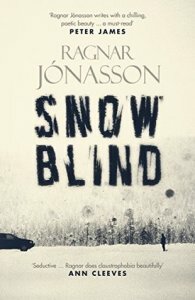 Ragnar Jonasson in ‘Snow Blind’ breathes life into Siglufjörður and its Arctic winter with great skill. You can physically feel the freezing wind bite, you share the characters’ helplessness at being hemmed in by man-high snowdrifts, cut off from civilisation once the only road in and out of the town is severed by an avalanche, a common occurrence in the January blizzards. A tiny, segregated town is a superb setting for a crime novel, and Jonasson exploits it well. He builds a layered mystery featuring a series of unhealthy secrets, and past crimes buried deep in the sheltered, almost claustrophobic recesses of family life, which Ari Thor will pay a high price for unravelling. An orphaned young man from Reykjavik with a couple of failed attempts at university studies under his belt (philosophy and theology), Ari Thor lands his first police posting – in the middle of Iceland’s financial collapse of autumn 2008 – in far-away Siglufjörður, all but losing his Reykjavik girlfriend in the process. A new boy and an out-of-towner in a closely-knit community, Ari Thor struggles to adapt, despite the friendliness of his amiable superior in a local police force of three, experienced Tomas. Nothing seems to happen in Siglufjörður except for a huge amount of winter weather. Ari Thor feels increasingly displaced, the more so as his girlfriend appears to be too distant to care. Then two dramatic incidents shake the isolated community: the death from a suspicious, possibly drunken fall of one of its doyens, internationally-acclaimed writer Hrolfur Kristjansson; and the discovery of the body of Linda, a young woman, left half-naked and dying in the snow with stab wounds to her chest. Both incidents are hard to fathom: did Hrolfur, who had been arguing with cranky director Ulfur during the rehearsals of the local Dramatic Society’s annual play, fall to his death, or was he pushed? Did Linda, whose brooding, violent partner Karl was cheating on, try to kill herself, or was the crime the consequence of one of Karl’s beatings? None of the Siglufjörður cops really knows what to do. I too was occasionally at pains to follow the ins and outs of the large cast of characters Jonasson has assembled. But just as Ari Thor, through sheer perseverance and intuition, and endless conversations with the close-mouthed townspeople, slowly begins to find a promising thread, or threads, so I was drawn in by Jonasson’s gripping tale. As you’d expect in such a remote, isolated location, the investigation is a far cry from CSI and contemporary urban cop shows, but it’s no less interesting. There’s a rhythm to Ari Thor’s seemingly dead-end questioning of the wary townspeople that’s quaintly old-fashioned, yet chimes perfectly with the long nights and short days of unremitting snowfall in Siglufjörður. But Ari Thor’s youthful enthusiasm – a welcome novelty in the Scandi-crime panorama of beleaguered semi-misfits, from Wallander to Sarah Lund, does carry the story, helped by his only friend Ugla, a young woman for whom he has a coyly- sketched (another novelty…) attraction, a protégé of Hrolfur, herself with a harsh past to contend with. And even if Jonasson does pull a couple of slightly underhand tricks – in crime fiction terms – on the reader, by deliberately concealing some clues Ari Thor’s pursuing, ‘Snow Blind’ is every bit as gripping as any orthodox police procedural. With the added fascination of its extraordinary, unconventional setting and the satisfaction of a well-realised cast of characters. Even seen through Ari Thor’s eyes, those of an out-of-towner who has to fight every inch of the way for respect and to uncover the astonishing truth behind the crimes, the people of Siglufjörður win the reader’s appreciation for the sheer bravery with which, each after his or her own fashion, they meet the daily challenge of getting on with their lives in this remote corner of Iceland. Well done Ragnar Jonasson for this unusual and gripping novel, and I look forward to more!